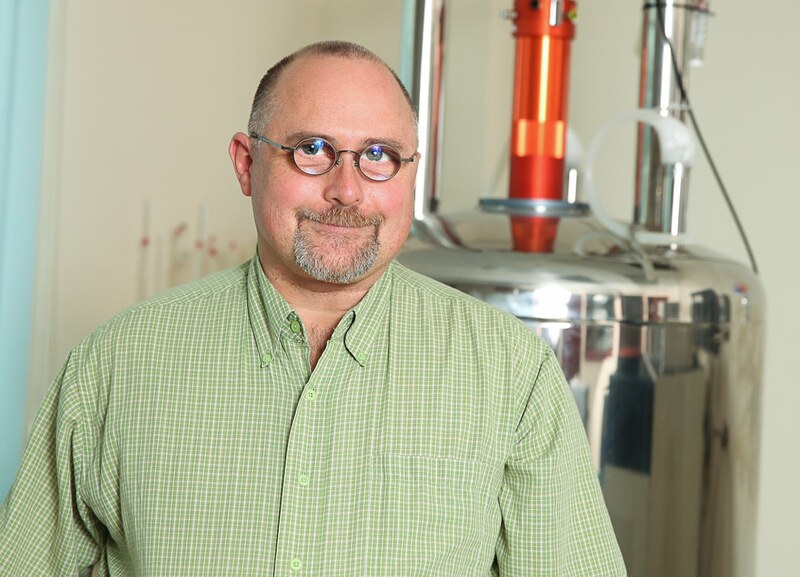 Seemingly simple NMR spectra often contain much more information than one might think. 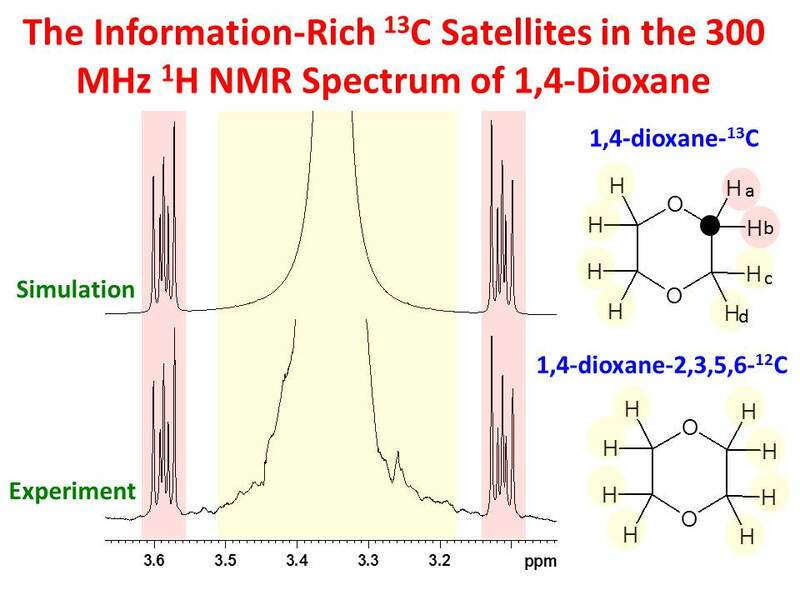 For example, the 1H NMR spectrum of 1,4-dioxane is primarily a singlet from which one obtains only an isotropic 1H chemical shift value. There is however much more information available in the spectrum which is often not recognized or used. The 1H NMR spectrum of a naturally occurring sample of 1,4-dioxane is the weighted sum of the 1H spectra of all possible isotopomers. It is the dominant tetra-12C isotopomer that gives rise to the singlet but since 13C (spin I = 1/2) is 1.1% naturally abundant, one expects to observe also the mono-13C isotopomer. The di-, tri- and tetra-13C isotopomers are very rare and can be neglected. The symmetry in the mono-13C isotopomer is lost compared to the tetra-12C isotopomer and one obtains a complex second-order spectrum, part of which can be represented by an AA'BB'X spin system. The spectrum of the AA'BB'X spin system depends on many more parameters than just the isotropic 1H chemical shift. This is illustrated in the figure below. 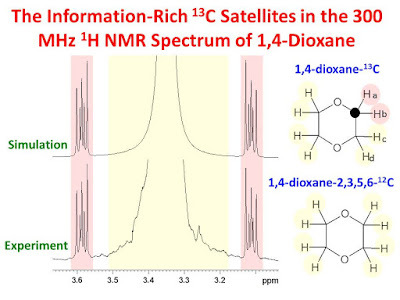 The bottom panel of the figure is the measured 300 MHz 1H NMR spectrum of 1,4-dioxane with an exaggerated vertical scale to accentuate the 13C satellites resulting from the protons color coded in pink in the mono-13C isotopomer. The large central region of the spectrum is the result of all the protons color coded in yellow from both the tetra-12C and mono-13C isotopomers. A simulation of this second-order spectrum was calculated from the parameters below and is shown in the top panel of the figure. Any isotope shifts in the 1H frequencies due to 13C vs 12C bonding were neglected in the simulation. The fit of the simulation to the 13C satellites is particularly sensitive to 1JC-Ha, 1JC-Hb, 3JHa-Hc, 3JHa-Hd, 3JHb-Hc and 3JHb-Hd and much less sensitive to 2JC-Hc, 2JC-Hd, 2JHa-Hb and 2JHc-Hd. A fit of the simulation to the experimental spectrum produces estimates for all of the coupling constants in the AA'BB'X spin system - much more information than a single 1H isotropic chemical shift! Start NMRSIM load zg as pulsprogram and the spins system. Set O1P to 3.3, SW to 2 ppm and TD to 32768. Choose "acquisition" for relaxation. And go.